The Geo Trade Blog: Nuclear powered aircrafts, could they become a reality? Nuclear powered aircrafts, could they become a reality? A recent work by Cranfield University's Bhupendra Khandelwal on an air transport model that combines nuclear-powered cruisers with chemical-powered short-range transports considers this possibility. As these long-range cruisers continually fly looping tracks that cross oceans and take them over major population centres, shorter-range aircraft would bring up passengers and cargo that would ride on the cruiser until they reach their destinations, where they would transfer to other short-range aircraft and fly down to land. He has developed an air transport model (below) that combines nuclear-powered cruisers with chemical-powered short-range aircraft. Graphic courtesy of Cranfield University Study, UK. Taking off from conventional airports, flying to and landing on the cruiser, the chemical-powered transport would be optimised for take-off, climb and landing, with no need to cruise. 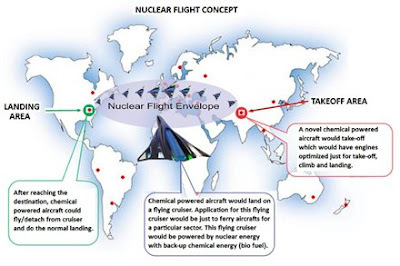 This would reduce emissions, says Khandelwal, as the nuclear-powered transport would carry the aircraft to its destination, where it would detach from the cruiser to descend and land normally. The cruiser, meanwhile, would have taken off from a remote site. This and its extreme endurance, which significantly reduces the number of take-offs and landings, would minimise the risk of a crash leading to a nuclear incident. Also the cruiser would be unmanned, he says, improving safety and avoiding the risk to a crew of prolonged radiation exposure during the cruiser's extended voyage. For further safety, the cruiser would have back-up chemical propulsion. Khandelwal calculates this air-transport model could produce a fuel saving over conventional point-to-point flights of 40% for a 1,000km mission, rising to 85-90% for a 10,000km mission, where the chemical-fuelled flights to and from the cruiser would be a smaller fraction of the total. Nuclear propulsion could be either direct or indirect cycle. In direct cycle, air flows through the compressor, into the reactor where it is heated, and out through the turbine. The risk here is radiation in the exhaust gases. In an indirect cycle a heat exchanger transfers energy from the reactor to the airflow. The radiation risk is reduced, but so too is thrust. Khandelwal's work provides much food for thought on new models of air travel in the 21st Century. The Geo-Trade Blog will continue to follow new innovative models for air transport with the potential to reshape travel and trade.